A map of East Africa showing some of the historically active volcanoes (as red triangles) and the Afar Triangle (shaded at the center), which is a so-called triple junction (or triple point) where three plates are pulling away from one another: the Arabian Plate and two parts of the African Plate—the Nubian and Somali—splitting along the East African Rift Zone. The East African Rift (EAR) is an active continental rift zone in East Africa. The EAR began developing around the onset of the Miocene, 22–25 million years ago. In the past it was considered to be part of a larger Great Rift Valley that extended north to Asia Minor. 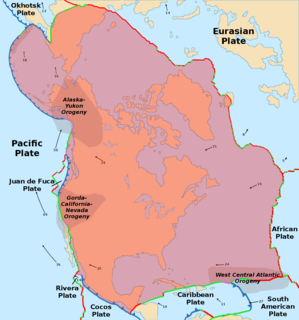 The rift, a narrow zone, is a developing divergent tectonic plate boundary where the African Plate is in the process of splitting into two tectonic plates, called the Somali Plate and the Nubian Plate, at a rate of 6–7 mm (0.24–0.28 in) annually. As extension continues, lithospheric rupture will occur within 10 million years; the Somali Plate will break off and a new ocean basin will form. The Somali Plate is a minor tectonic plate, which straddles the equator in the eastern hemisphere. 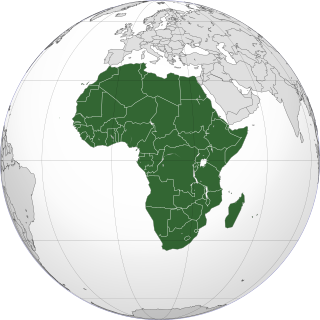 It is approximately centered on the island of Madagascar and includes about half of the East coast of Africa, from the Gulf of Aden in the North through the East African Rift Valley. The southern boundary with the Nubian-African plate is a diffuse plate boundary consisting of the Lwandle plate. A series of distinct rift basins, the East African Rift System extends over thousands of kilometers. The EAR consists of two main branches. The Eastern Rift Valley (also known as Gregory Rift) includes the Main Ethiopian Rift, running eastward from the Afar Triple Junction, which continues south as the Kenyan Rift Valley. 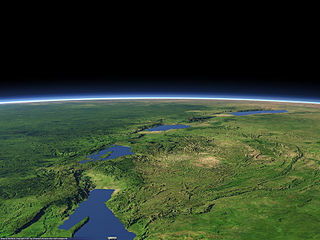 The Western Rift Valley includes the Albertine Rift, and farther south, the valley of Lake Malawi. To the north of the Afar Triple Junction, the rift follows one of two paths: west to the Red Sea Rift or east to the Aden Ridge in the Gulf of Aden. The Gregory Rift is the eastern branch of the East African Rift fracture system. The rift is being caused by the separation of the Somali plate from the Nubian plate, driven by a thermal plume. Although the term is sometimes used in the narrow sense of the Kenyan Rift, the larger definition of the Gregory Rift is the set of faults and grabens extending southward from the Gulf of Aden through Ethiopia and Kenya into Northern Tanzania, passing over the local uplifts of the Ethiopian and Kenyan domes. Ancient fossils of early hominins, the ancestors of humans, have been found in the southern part of the Gregory Rift. 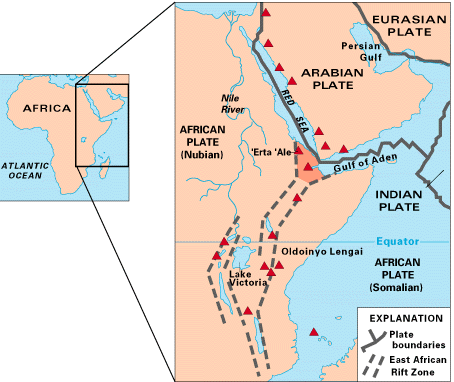 The Afar Triple Junction is located along a divergent plate boundary dividing the Nubian, Somali, and Arabian plates. This area is considered a present-day example of continental rifting leading to seafloor spreading and producing an oceanic basin. Here, the Red Sea Rift meets the Aden Ridge and the East African Rift. It extends a total of 6,500 kilometers (4,000 mi) in three arms from the Afar Triangle to Mozambique. The Afar Triangle is a geological depression caused by the Afar Triple Junction, which is part of the Great Rift Valley in East Africa. The region has disclosed fossil specimens of the very earliest hominins, that is, the earliest of the human clade; and it is thought by some paleontologists to be the cradle of the evolution of humans, see Middle Awash, Hadar. The Depression overlaps the borders of Eritrea, Djibouti and the entire Afar Region of Ethiopia; and it contains the lowest point in Africa, Lake Asal, Djibouti, at 155 m below sea level. Over time, many theories have tried to clarify the evolution of the East African Rift. In 1972 it was proposed that the EAR was not caused by tectonic activity, but rather by differences in crustal density. Since the 1990s, evidence has been found in favor of mantle plumes beneath the EAR. Others proposed an African superplume causing mantle deformation. The question is still debated. 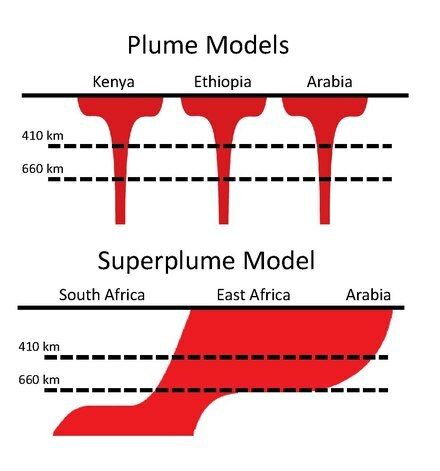 The conceptual extensional difference between plume models and the superplume model placed beneath the East African Rift. Modified from Hansen et al. 2012. Maps of four different depth slices of the Shear-velocity (Vs) model developed by Emry et al. 2018. The forms of the zones with lower Vs (colors toward red) suggest the hotter structures in the Mantle. The distinguishing fourth map depicts a depth below the 410 km discontinuity where Vs steeps up (getting overall bluer), but it still displays the signature of a plume at the substrate of the East African Rift. In the white box, the Vs vertical profile at 10°N, 40°E illustrates the increase of velocity with depth and the effect of the 410 km discontinuity. Although reasonably considered, the exact conformation of deep-rooted mantle plumes is still a matter of active research. Studies that contribute to the broader understanding on the evolution of rifts can be grouped into the techniques of isotope geochemistry, seismic tomography and geodynamical modeling. 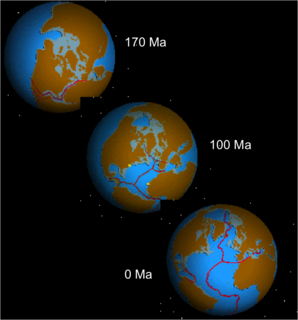 Prior to rifting, enormous continental flood basalts erupted on the surface and uplift of the Ethiopian, Somali, and East African plateaus occurred. The first stage of rifting of the EAR is characterized by rift localization and magmatism along the entire rift zone. Periods of extension alternated with times of relative inactivity. There was also the reactivation of a pre-Cambrian weakness in the crust, a suture zone of multiple cratons, displacement along large boundary faults, and the development of deep asymmetric basins. The second stage of rifting is characterized by the deactivation of large boundary faults, the development of internal fault segments, and the concentration of magmatic activity towards the rifts. Seafloor spreading is a process that occurs at mid-ocean ridges, where new oceanic crust is formed through volcanic activity and then gradually moves away from the ridge. In plate tectonics, a divergent boundary or divergent plate boundary is a linear feature that exists between two tectonic plates that are moving away from each other. Divergent boundaries within continents initially produce rifts which eventually become rift valleys. Most active divergent plate boundaries occur between oceanic plates and exist as mid-oceanic ridges. Divergent boundaries also form volcanic islands which occur when the plates move apart to produce gaps which molten lava rises to fill. A craton is an old and stable part of the continental lithosphere, where the lithosphere consists of the Earth's two topmost layers, the crust and the uppermost mantle. Having often survived cycles of merging and rifting of continents, cratons are generally found in the interiors of tectonic plates. They are characteristically composed of ancient crystalline basement rock, which may be covered by younger sedimentary rock. They have a thick crust and deep lithospheric roots that extend as much as several hundred kilometres into the Earth's mantle. The Iceland plume is a postulated upwelling of anomalously hot rock in the Earth's mantle beneath Iceland. Its origin is thought to lie deep in the mantle, perhaps at the boundary between the core and the mantle at approximately 2,880 km depth. Opinions differ as to whether seismic studies have imaged such a structure. In this framework, the volcanism of Iceland is attributed to this plume, according to the theory of W. Jason Morgan. The Anahim hotspot is a volcanic hotspot located in the West-Central Interior of British Columbia, Canada. One of the few hotspots in North America, the Anahim plume is responsible for the creation of the Anahim Volcanic Belt. This is a 300 km (190 mi) long chain of volcanoes and other magmatic features that have undergone erosion. The chain extends from the community of Bella Bella in the west to near the small city of Quesnel in the east. While most volcanoes are created by geological activity at tectonic plate boundaries, the Anahim hotspot is located hundreds of kilometres away from the nearest plate boundary. The Azores hotspot is a volcanic hotspot located at the Azores in the Northern Atlantic Ocean. A volcanic hotspot is defined as an area of high volcanic activity, a long term source of volcanism. The type of hotspot that characterises the Azores is a relatively young one associated with a bathymetric swell, a gravity anomaly and basalt geochemistry that differs from normal ocean ridge basalts. The Azores hotspot also differs from usual hotspots like Hawaii due the fact that it has interactions with the Mid-Atlantic Ridge, which lies just west of the hotspot. The centre of the hotspot plume has been suggested to be located 100 to 200 km east of the Mid-Atlantic Ridge near the island of Faial. 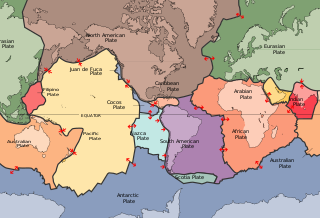 This is a list of articles related to plate tectonics and tectonic plates. Noronha hotspot is a hypothesized hotspot in the Atlantic Ocean. It has been proposed as the candidate source for volcanism in the Fernando de Noronha archipelago of Brazil, as well as of other volcanoes also in Brazil and even the Bahamas and the Central Atlantic Magmatic Province. ↑ Ebinger, Cynthia (April 2005). "Continental break-up: The East African perspective". Astronomy and Geophysics. 46 (2): 2.16–2.21. doi:10.1111/j.1468-4004.2005.46216.x. ↑ Fernandes, R.M.S. ; Ambrosius, B.A.C. ; Noomen, R.; Bastos, L.; Combrinck, L.; Miranda, J.M. ; Spakman, W. (2004). "Angular velocities of Nubia and Somalia from continuous GPS data: implications on present-day relative kinematics". Earth and Planetary Science Letters . 222 (1): 197–208. Bibcode:2004E&PSL.222..197F. doi:10.1016/j.epsl.2004.02.008. 1 2 3 4 5 Corti, G. "The Ethiopian Rift Valley". National Research Council of Italy, Institute of Geosciences and Earth Resources. Retrieved March 19, 2014. 1 2 3 Mougenot, D.; Recq, M.; Virlogeux, P.; Lepvrier, C. (June 1986). "Seaward extension of the East African Rift". Nature. 321 (6070): 599–603. Bibcode:1986Natur.321..599M. doi:10.1038/321599a0. ↑ Chorowicz, Jean (2005). "The East African rift system". Journal of African Earth Sciences. 43 (1): 379–410. Bibcode:2005JAfES..43..379C. doi:10.1016/j.jafrearsci.2005.07.019. ↑ Mascle, J; Moungenot, D.; Blarez, E.; Marinho, M.; Virlogeux, P. (1987). "African transform continental margins: examples from Guinea, the Ivory Coast and Mozambique". Geological Journal. 2. 22: 537–561. doi:10.1002/gj.3350220632. ↑ Scrutton, R.A. (1978). "David fracture zone and the movement of Madagascar". Earth and Planetary Science Letters. 39 (1): 84–88. Bibcode:1978E&PSL..39...84S. doi:10.1016/0012-821x(78)90143-7. ↑ Montelli, R.G. ; et al. (2006). "A catalogue of deep mantle plumes: New results from finite‐frequency tomography". Geochem. Geophys. Geosyst. 7 (11): n/a. Bibcode:2006GGG.....711007M. doi: 10.1029/2006GC001248 . 1 2 Ebinger, C. J.; Sleep, N. H. (October 1998). "Cenozoic magmatism throughout east Africa resulting from impact of a single plume". Nature. 395 (6704): 788–791. Bibcode:1998Natur.395..788E. doi:10.1038/27417. 1 2 Corti, Giacomo (September 2009). "Continental rift evolution: From rift initiation to incipient break-up in the Main Ethiopian Rift, East Africa". Earth-Science Reviews. 96 (1–2): 1–53. Bibcode:2009ESRv...96....1C. doi:10.1016/j.earscirev.2009.06.005. ↑ Hansen, Samantha E.; Nyblade, Andrew A.; Benoit, Margaret H. (February 2012). "Mantle structure beneath Africa and Arabia from adaptively parameterized P-wave tomography: Implications for the origin of Cenozoic Afro-Arabian tectonism". Earth and Planetary Science Letters. 319-320: 23–34. Bibcode:2012E&PSL.319...23H. doi:10.1016/j.epsl.2011.12.023. ↑ Trabant, C.; Hutko, A. R.; Bahavar, M.; Karstens, R.; Ahern, T.; Aster, R. (6 September 2012). "Data Products at the IRIS DMC: Stepping Stones for Research and Other Applications". Seismological Research Letters. 83 (5): 846–854. doi:10.1785/0220120032. ↑ Furman, Tanya (June 2007). "Geochemistry of East African Rift basalts: An overview". Journal of African Earth Sciences. 48 (2–3): 147–160. Bibcode:2007JAfES..48..147F. doi:10.1016/j.jafrearsci.2006.06.009. ↑ Halldórsson, Saemundur A.; Hilton, David R.; Scarsi, Paolo; Abebe, Tsegaye; Hopp, Jens (16 April 2014). "A common mantle plume source beneath the entire East African Rift System revealed by coupled helium-neon systematics". Geophysical Research Letters. 41 (7): 2304–2311. Bibcode:2014GeoRL..41.2304H. doi: 10.1002/2014GL059424 . ↑ Civiero, Chiara; Hammond, James O. S.; Goes, Saskia; Fishwick, Stewart; Ahmed, Abdulhakim; Ayele, Atalay; Doubre, Cecile; Goitom, Berhe; Keir, Derek; Kendall, J.-Michael; Leroy, Sylvie; Ogubazghi, Ghebrebrhan; Rümpker, Georg; Stuart, Graham W. (September 2015). "Multiple mantle upwellings in the transition zone beneath the northern East-African Rift system from relative P-wave travel-time tomography". Geochemistry, Geophysics, Geosystems. 16 (9): 2949–2968. Bibcode:2015GGG....16.2949C. doi: 10.1002/2015GC005948 . ↑ Emry, E. L.; Shen, Y.; Nyblade, A. A.; Flinders, A.; Bao, X. (11 December 2018). 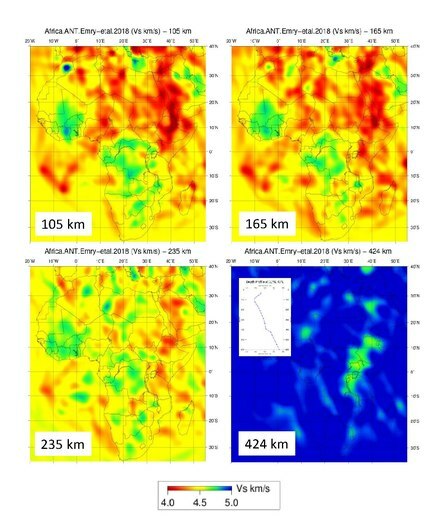 "Upper mantle earth structure in Africa from full‐wave ambient noise tomography". Geochemistry, Geophysics, Geosystems. doi: 10.1029/2018GC007804 . ↑ Koptev, Alexander; Burov, Evgueni; Calais, Eric; Leroy, Sylvie; Gerya, Taras; Guillou-Frottier, Laurent; Cloetingh, Sierd (March 2016). "Contrasted continental rifting via plume-craton interaction: Applications to Central East African Rift". Geoscience Frontiers. 7 (2): 221–236. doi: 10.1016/j.gsf.2015.11.002 . ↑ Koptev, Alexander; Burov, Evgueni; Gerya, Taras; Le Pourhiet, Laetitia; Leroy, Sylvie; Calais, Eric; Jolivet, Laurent (October 2018). "Plume-induced continental rifting and break-up in ultra-slow extension context: Insights from 3D numerical modeling". Tectonophysics. 746: 121–137. Bibcode:2018Tectp.746..121K. doi:10.1016/j.tecto.2017.03.025. ↑ Taylor, C.D. ; Schulz, K.J. ; Doebrich, J.L. ; Orris, G.J. ; Denning, P.D. ; Kirschbaum, M.J. "Geology and Nonfuel Mineral Deposits of Africa and Middle East". US Department of the Interior, US Geological Survey. 1 2 Saemundsson, K (2009). "East African Rift System-An Overview". Reykjavik: United Nations University, Iceland GeoSurvey. ↑ Siebert, L.; Simkin, T.; Kimberly, P. (2010). Volcanoes of the World. University of California Press. 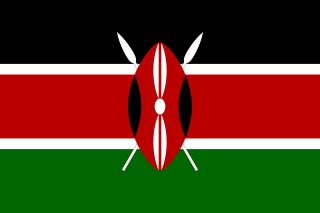 ↑ "Great Rift Valley Ecosystem – UNESCO World Heritage Centre". UNESCO. Retrieved March 14, 2008. ↑ Gibbons, A. (2002). "Profile: Michel Brunet: One Scientist's Quest for the Origin of Our Species". Science. 298 (5599): 1708–1711. doi:10.1126/science.298.5599.1708. PMID 12459568. ↑ Seward, Liz (2007). "Fossils belong to new great ape". BBC News London. Retrieved March 14, 2008.